Want Mozart to MoTown?...Nat King Cole to Alesha Keyes? ...Patsy Kine to Michael Jackson? We offer digital talents as great solo acts or in ensemble with each other! 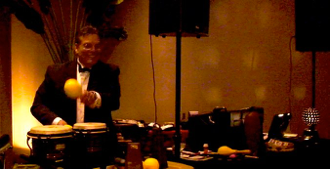 Tony Martinez is a talented a professional bilingual MC, Latin Percussionist and full service DJ. Over 50,000 tunes w/ lights. Smoke / karaoke sets are available options. LIVE CONGA accents take the music --and the audience!--to a new level! We’ve got your voices too! DIGITAL MUSIC WITH LIVE SINGERS creates a truly amazing evening of great music. Intimate or Public venue--These vocalists combine great tunes with crowd-pleasing singing and acting skills --often strolling among your guests --making every seat the best seat in the house! Terry plays and sings of the 40’s + Jazz, Pop, Romantic, Motown, Dance and Soul. Perfect for Dance parties, Class Reunions Restaurants & Dinners. His broadway stylings and familiarity with a huge selection of popular dance tunes can rock any party! Click here for her Songlist! Kijana’s familiar tunes set the mood for your receptions, weddings, luncheons, banquets, country clubs, marriage proposals and other special events.